The Stihl MS 462 C-M and MS 462 R C-M chain saws were specially engineered for the professional user who desires more power and reduced weight, resulting in less user fatigue. Both chain saw models feature an excellent power-to-weight ratio. 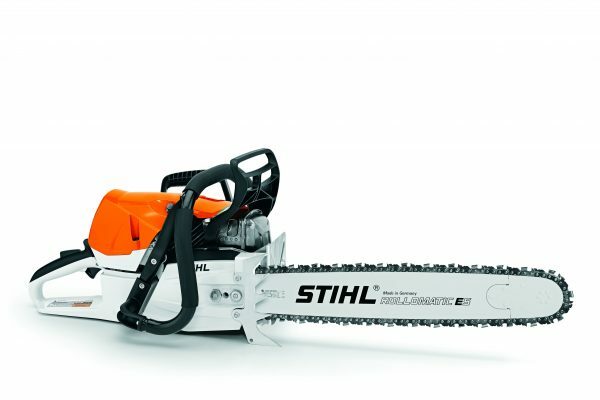 These chain saws feature the next generation of the Stihl M-Tronic engine management system, which electronically controls ignition timing and fuel metering. Conveniently, the saws auto-adjust or adapt to varying operating conditions, such as changes in altitude and fuel quality for optimal performance. An anti-vibration system ensures acceptable handling, especially with longer guide bars, making the MS 462 C-M chain saws the partner you’ll want by your side all day. Highlight-worthy features designed with the professional in mind, include: A slim sprocket cover reduces weight and wood chip clogging; decreasing down time spent removing wood chips from the cover. The unique bumper spike design has fewer teeth with wider spacing, helping users maintain control when bucking and felling trees; while vertical and horizontal felling marks on the fan housing to provide better directional guidance. Additionally, the Stihl MS 462 R C-M comes equipped with a wrap handle, allowing the chain saw to be used in multiple positions for felling or limbing while hands stay in the proper position.